Unleashing the second week of January! Weekly Horoscope for the week from 09th of January, 2017 to 15th of January, 2017 is here to help you know your weekly horoscope prediction. Let us know what the second week of the beautiful year 2017 has in store for us! This week might prove to be full of professional gains for the natives of Aries sign. You can expect a hike in the opportunities to earn further during this period. Your childs’ health might need added attention and care this week. Your long stuck work is predicted to gain momentum in this period. Also, you might find a new interest in philanthropy this week, to keep yourself creatively engaged. LOVE PREDICTIONS: This week seems to be blissful for your love relation. Those planning to make a pitch for marriage might have success this week. The onset of the week can be expected to be brimming with love talks and similar engagements with your love partner. The mid of the week will be as cheerful and lively as the weekend. Though, there are increased chances of insecurities trickling down in your relationship. REMEDY: Chant Hanuman chalisa regularly. This week might bring augmentation in your authority at work. Try to abstain from any such activity which might lead to a controversy later. Students belonging to this sign can expect exceptional success in their academia. This duration might induce troubles in paradise for you. You understanding and communication with your spouse might feel disrupted in this period. Try to stay calm and take things one at a time. LOVE PREDICTIONS: This week is predicted to be routinely and typical for your love life. You might find it difficult to establish an equilibrium between work and your private life during this period. You might have to exercise restrain in this period so as to focus on different facets of your relationship. Prioritising your love life equally as your work might bring in better results this week. The week is predicted to begin in a subtle manner but might end with a wee bit of stress in your relationship. REMEDY: offer red flowers to Maa Durga. This week is foreseen to demand high determination from the Geminis. Trips and excursions with family and friends is also on the cards during this period. You might feel strongly inclined towards your spouse but similar efforts and devotion might not find their way back to you. Your expenses might rise during this period hence, try to keep a tab on your expenses. Your professional and personal life is foreseen to flourish in this duration. LOVE PREDICTIONS: This week seems to be blissful for your love relation though, you will have to exercise restrain in terms of your flirting habits during this period. You might not get ample opportunities to meet your beloved during the onset of the week. While, mid of the week is predicted to be an opportune duration to put your forth views. Weekend can be expected to be brimming with romance and intimacy for you. REMEDY: Recite vishnu sahasranama regularly. This week might focus all your attention towards increasing your professional gains and earning a better social status. You might find solace in performing religious activities in this duration. Try to abstain from forming intimate relations during this period as this might lead to defamation. Your childs’ health might need extra attention during this period. A pilgrimage is probable for a few this week. Short trips and excursions are also on the cards for a few. LOVE PREDICTIONS: This week might need extra efforts to keep the sanity and love intact in your relationship. Try to abstain from unnecessary squabbles and misunderstandings. Maintaining your calm and practicing adequate restrain might give a fabulous start to your week. Mid of the week might not be as splendid as you might expect but the weke can be expected to end with much love and exuberance. REMEDY: Feed jaggery and chickpeas(chana) to monkeys. This week might not be a good time to take major decisions of your personal or professional life. Sudden professional gains are likely for some. You will be able to enjoy a good time with your spouse this week though, occasional tiffs seem to be in the vicinity. You can expect complete support and cooperation from your female colleagues. Stress bearing issues might come up at your domestic front that might need careful handling in this period. LOVE PREDICTIONS: This week is foreseen to be pleasant for your love relation. Try to maintain the decorum of your relationship by abstaining from forced intimacy and sensual activities as this might lead to defamation. Try to retain the purity in your relationship and proceed only with your partners’ consent. Those in a love relationship with a colleague will be able to make the most of the beginning of the week. Middle of the week might feel a bit drab but the week can be expected to end on a pleasant note. REMEDY: Offer water to Lord Sun after taking a bath, before 8 am. This week will test your abilities of taking wise and well balanced decisions. Students can expect this week to be a rewarding one. Your private life is also predicted to be pleasant. You can aim higher this week as your luck will be completely in your favour. Those planning to invest in property for personal usage might taste success this week. Though, this success might cost them slight efforts and hard work. A few might get to dip their feet in foreign waters during this period. LOVE PREDICTIONS: This week might be bitter-sweet for your love relation. Those having an inclination towards leisure and entertainment will be able to make the most of this week while those having a no-nonsense attitude might remain anxious during this period. You might be under surveillance of your close ones hence, maintain your conduct accordingly. The beginning and mid of the week might seem a wee bit dull but the weekend is predicted to bring back the lost calmness and bliss. REMEDY: Offer 4 bananas to lord hanuman on Tuesday. 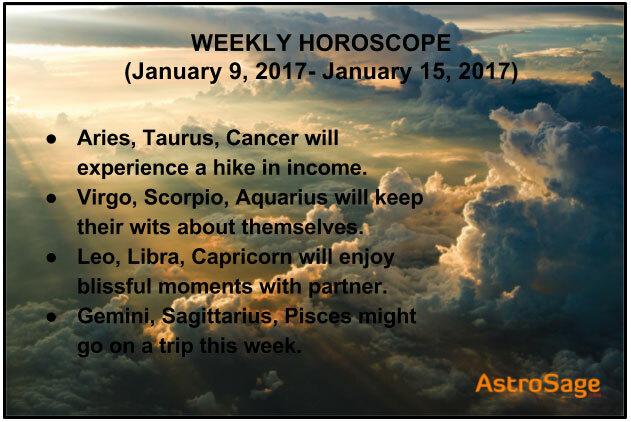 This week is expected to bring financial sturdiness in your life. Your earnings are expected to undergo a hike. Remaining determined and focused at work must be your mantra this week. Your private life seems to be pleasant as you will be able to spend quality time with your partner. Try to wait for the consent of your partner before making a move that might be objectionable. Behaving well with women will be just what you would need to ace through personally and professionally. LOVE PREDICTIONS: Your love relation is predicted to be pleasant this week. Try to abstain from sarcastic and ironical behavior in this period. Sweet talk your way into your spouses’ heart and try not upset them during this period. Choose your words before putting your views forth so as to reduce the possibilities of a probable tiff. The week might not begin as per your hearts’ desire. Situations might get better by the mid of the week paving your way to a splendid weekend. REMEDY: Feed little girls with kheer. This week might come with mental stress and worries for the scorpions. Try to be attentive at vocation during this period. Some conspiracies might stew at work against you hence, be cautious and alter your conduct accordingly. Earnings might increase in this period. Students belonging to this sign are expected to do well during this period. Your children would flourish this week. Though, clashes at the home front are possible in this duration. Try to handle delicate situations with utmost care and precaution. LOVE PREDICTIONS: This week, you might get favourable results and you might have the utmost desire to propose someone. However, if it is done done in the starting of the week then it would prove to be beneficial for you. As the mid of the week is quite dicey for you, so you should be quite patient in your actions. In the end of the week you will get worthwhile results and probable chances are there that you might feel inclined towards a colleague and the chemistry might gain full swings. REMEDY: Recite ram raksha stotra regularly. You will be able to enjoy fame and glory at work this week. Adequate hard work and determination will surely yield good results for you. However, choose your confidants wisely as the chances of finding backstabbers at work are high this week. Your health might need extra attention during this period as cough, cold and joint pain could bother you. A strong will and a supportive spouse will make your journey easy during this period. Family life is predicted to be harmonious. Long and short journeys are on the cards for a few. LOVE PREDICTIONS: This week is predicted to be blissful, in general, for your love relation. Though, your partner might complain of a selfish and erratic attitude of yours towards them. Try to handle situations of this sort with a calm and composed mind. Try to utmost best to nip this misconception in the bud as small misunderstandings might make their way to large quarrels. Middle of the week might seem a wee bit drab but the weekend comes with a promise to straighten much of your problems. This week might bring physical harm and injury to you hence, be careful, especially while driving. Romance will be at its peak this week as you will enjoy a good temperament and superb mood in this period. Though, there are increased chances of frustration and exasperation between you and your partner. You might indulge in spiritual and sacred deeds this week. This week, great results could be expected for students belonging to this sign. LOVE PREDICTIONS: The week looks dull for love affairs. Transparency and loyalty must be observed in your relationship. At the start of the week, new love could bring in happiness in your life. A colleague or a classmate could fancy you in this duration. By the mid of the week, slight bickering could sour your mood a little bit. Stay cautious of people who might take advantage of your secrets and make attempts to defame you during this period. REMEDY: Pay homage to Lord ganesha regularly. Workaholics can rejoice this week as this period is predicted to keep Aquarians mostly occupied with work. Professional gains are on the cards but only if they are welcomed by using intellect and common sense. Loss of wealth can also be expected for a few in this period. Augmentation in sensuality is predicted for you this week. Also differences with spouse and slight bickering is foreseen for the Aquarians during this period. This week might prove to professionally gainful for your spouse. LOVE PREDICTIONS: This week seems to be pleasant for your love relation. Try to abstain from any such activity which might put your character in negative light. Opportunities of meeting your partner in private are bountiful during the onset of the week. Some might feel inclined towards their peer or colleague by the mid of the week. Weekend is predicted to be full of fun and frolic for you and your partner. REMEDY: Chant Saturn mantra regularly. This week is expected to be bring happiness and prosperity in your family life and at your work front. You will be able to deal with different situations wisely while maintaining your composure. Though you might experience a lot of ups and downs in your mood and temperament. Long distance journeys are also possible for a few in this period. While some might enjoy romantic encounters in this duration. Students can expect increased academic success this week. LOVE PREDICTIONS: This week is predicted to be pleasant for your love relation. You will get ample opportunities to spend leisure time with your partner in this period. Your partner might ease out many of your problems and stress this week and will help you regain your mental calm. Those giving their relationship a new start this weekend can vouch for its longevity and stability. You can expect this weekend to bring back all that has been missing in your love relation for long. REMEDY: Worship Lord Shiva regularly.